Jiu-jitsu is for everyone and many jiu-jitsu students and instructors train and use BJJ to overcome limitations and add to their lives. Stuart Penn was born with an arm and leg missing. He is a fourth dan in taekwondo and a blue belt in Gracie Barra jiu-jitsu. “I was born with only one fully formed limb, my right arm. My left arm ends just below the elbow, my right leg ends at the knee, and my left leg has various bones missing and a small clubbed foot. Despite this I have always been focused on achieving whatever goals I set myself. I attended mainstream schooling in the UK, and qualified as a gym instructor and as a taekwondo instructor, in which I also hold a fourth-degree black belt”. “After years of wearing prosthetic limbs for all the sports I trained and competed in – snowboarding, swimming, sprinting, judo, taekwondo – I was most surprised by turning up to BJJ and being advised to leave all the technology behind and get onto the mat as just myself. For me this was a big change and immediately a big draw as I didn’t need to rely on the prosthetics and how they might be fitting at the time or how the various mechanisms might be and how close they might be to needing replacing”. 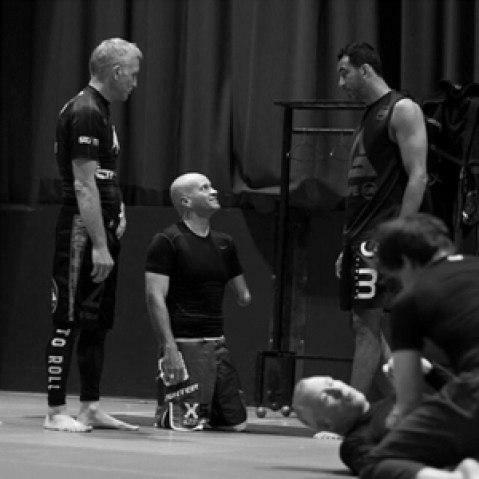 “I feel that BJJ has reinvigorated my love for pushing myself to the limits. I’ve always had a positive attitude and looked to challenge and achieve, but with two young children and a third on the way, as well as a full time job and house to keep up, life was beginning to get in the way of my natural desire to strive towards challenges. BJJ has given me a new outlet for this desire. Along with this, I feel the confidence boost BJJ gives me outside of my prosthetic limbs it immense. I have always been self-confident but have to admit that before BJJ, I was probably less confident in being without my prosthetics, as they have simply always been on me when I’ve achieved things. Not wearing them for BJJ gives such a different twist and a positive experience of being ‘limbless’. “My motto has always been that there is no such word as ‘can’t’. There is always a way; it is just sometimes harder, or takes longer, but if you want to get to something you can always find a way. BJJ on the mats optimizes this. Whether it’s adapting submissions to work with less limbs on the mat or adapting the way you tie a tie with only one hand, there is always a way”. There is always a way to do what you are striving to do. You just need to find it. Adapt and overcome works for every single one of us, no matter what our physical or mental obstacles might be.